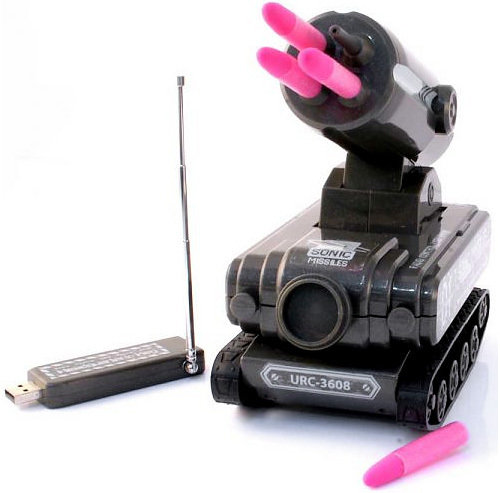 USB Tank Missile Launcher Steps Up Office Warfare | OhGizmo! By Andrew Liszewski on 01/26/09 • Leave a comment! Maybe you took my advice and tried the Inflatable Gladiator Combat Set from last week at work, but as a result, the atmosphere in your office is far from peaceful. Well that’s nothing that a handful of strategic annoyance strikes can’t resolve. (Or worsen, I forgot which.) And what better way is there to annoy a co-worker than with a barrage of tiny foam missiles? Not only will this RC tank deliver such a payload at a distance from up to 12 feet, but it can also be remotely controlled via the included ‘USB Tank’ PC software (and wireless USB dongle) giving you some level of deniability since you’ll never be caught holding a remote. The software allows you to steer the tank and raise or lower the missile launcher, but besides firing, that’s about it. There’s no camera on board so you’ll need to have a line of sight in order to properly steer it into position, but it does have a wireless range of about 25 feet giving you a tiny head start when the inevitable and immediate retaliation begins. At about $55 from RED5 (standing by) it’s a bit expensive for a toy that has a high probability of being stomped on after its first use, but I think the risk is worth it.